Beauty And The Sexist Floor Guy. Disney Can Have That One. “Well you didn’t tell me two women were coming to pick it up!” My flooring guy laughed, I fumed, and my friend Angie did her best to diffuse the situation and ensure I didn’t do something to invite a lawsuit. I prefer to work with local companies when it comes to flooring. Usually you’re going to have far more options than the big box stores and will be able to score a better deal. When Justin and I walked into the place I picked, I knew we chose right when it turned out our dealer lived right down the street from us. But I also knew we chose wrong, because no matter how many times Justin told him that he’d be dealing with me (because Justin was leaving town), the man refused to direct any questions my way and repeatedly bantered about indecisive wives and our unseemly overspending habits. The sad truth is, dealing with sexism in the realm of home renovations is not an isolated occurrence. “You drew this?” the drywaller I hired to handle our kitchen once inquired of my scale drawing. “Not your husband, but you?” Boys, I love you, but please. You have to stop assuming that just because I have breasts of the hairless variety that my dainty girl brain can’t handle material decisions, planning, purchasing, or transport. You just have to. Because, frankly, it’s not a wise business move. It’s a statistical fact that women make the majority of decisions when it comes to home decor, and while you might be used to typically dealing with male contractors, residential DIY-ers aren’t going away. And, if catered to smartly, they can prove to be a fairly equitable source of revenue. Just ask the founders of The Home Depot. I’ll never be comfortable dealing with someone who passively aggressively lets me know that he doesn’t take me seriously. But my time is a valuable commodity and he let me take home lots of samples, so I’m ashamed to admit that I didn’t address the situation while we were in the store so I could put it to rest. Instead, I bought some floor. 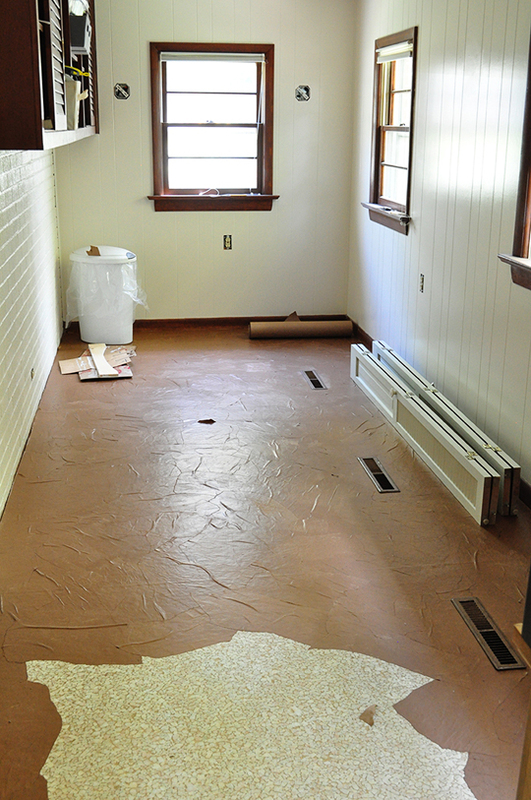 When I last showed you our laundry room progress, I mentioned a little SNAFU with the flooring situation. 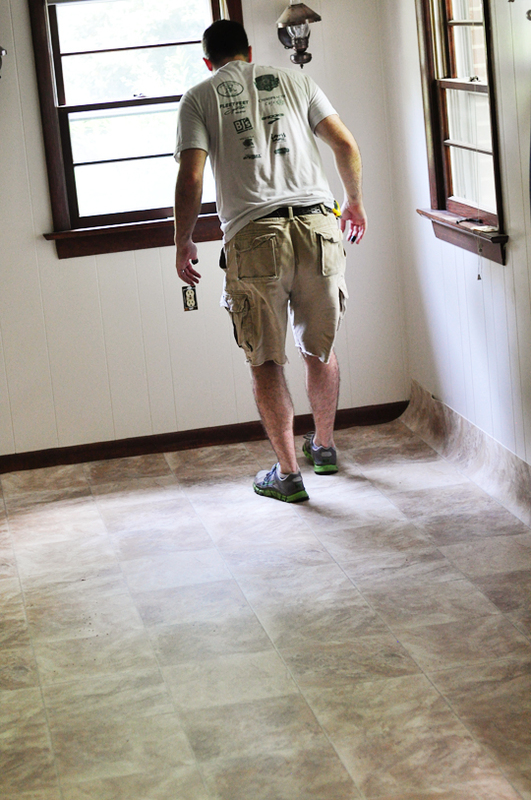 Justin was curious to try this brown paper flooring because it was definitely flat, mostly durable given enough polyurethane, and unarguably the cheapest solution at our disposal. They just didn’t happen to turn out. When brown bagging it went bust, my number one choice of painting using an exterior floor paint went out the window. There was simply no way we’d get the underlying linoleum clean enough from glue and paper to leave a smooth surface for paint. That left our final choice, sheet vinyl. Many people use the terms vinyl and linoleum interchangeably, but actually they’re two very different materials. Linoleum, which is made of natural and renewable linseed oil and other natural materials, is the ecologically responsible choice. While it does require a sealant and periodic maintenance, there’s no question as to which choice is friendlier on the environment — both outside and inside your home. But. Vinyl is cheaper, guys. And easier to DIY. 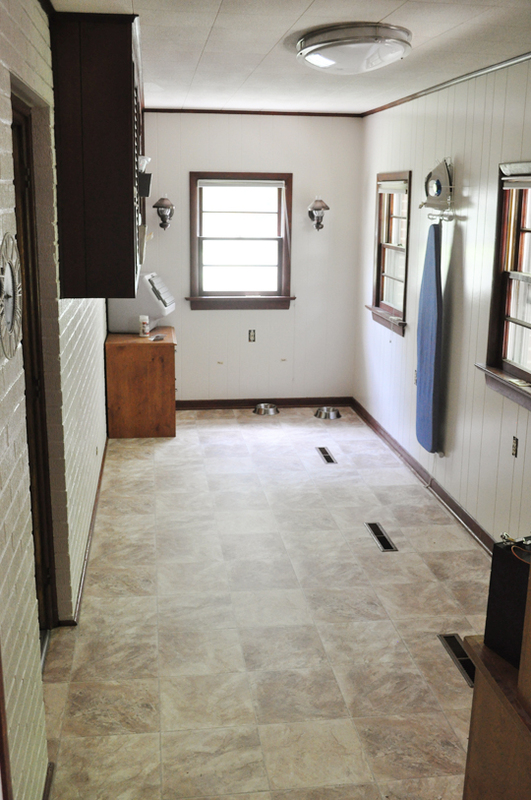 And since this is an itty bitty afterthought of a sunken room off our garage, Justin and I justified the non-eco,chlorinated, petrochemical-infused choice and bought a cheap vinyl our flooring guy had available in his warehouse. Since he was trying to get rid of it, he cut us a deal at $1.30/sq. ft. It seems like a few years ago, synthetic floor tiles were all the rage. But it didn’t take long for consumers to discover that their longevity — and therefore value — is highly questionable. Even my friend Alaina’s higher-end Congoleum floors, which require a much more rigorous application process than peel-and-stick vinyl, aren’t holding up to the wear of a normal household. 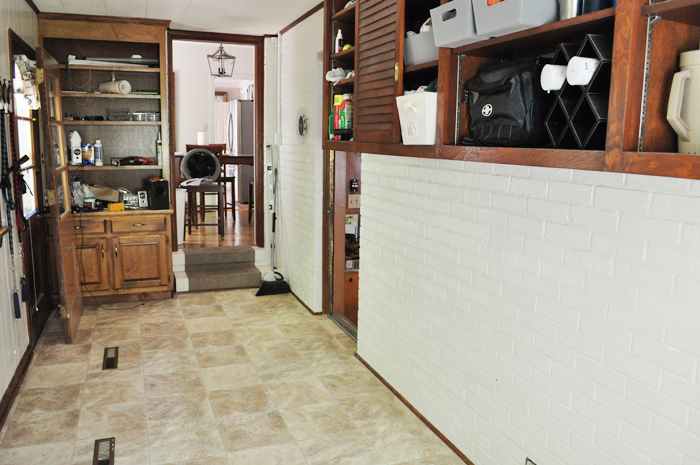 Also, one of the worst qualities of tile is its grout lines. 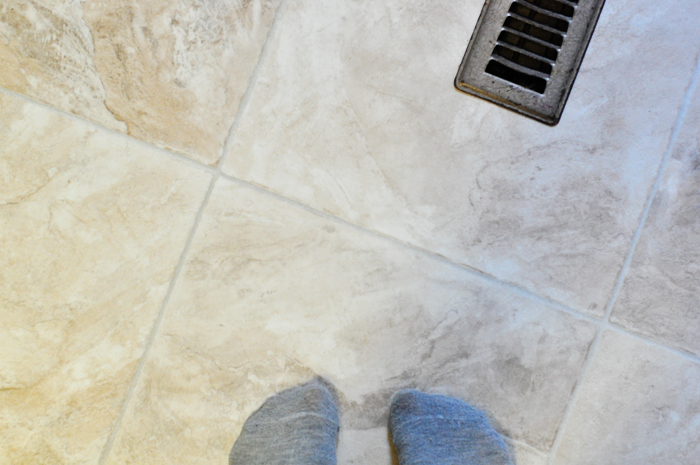 So why, if you’re choosing synthetic flooring, would you carry over an undesirable tile trait? I knew without question that I wanted sheet flooring even though it wouldn’t look like real tiles, because the only thing that looks like real tiles is real tiles. 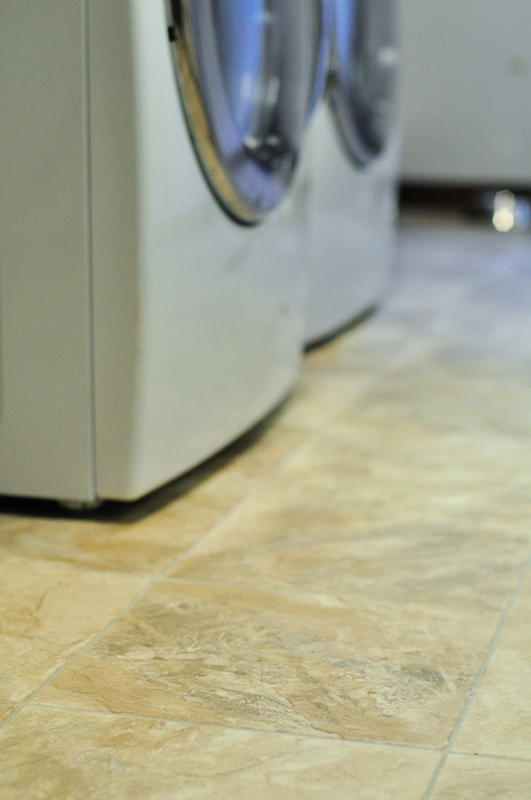 Plus sheet vinyl, though it requires measurements and cutting, is faster to install than the tile variety, and a seamless floor is less susceptible to moisture issues. 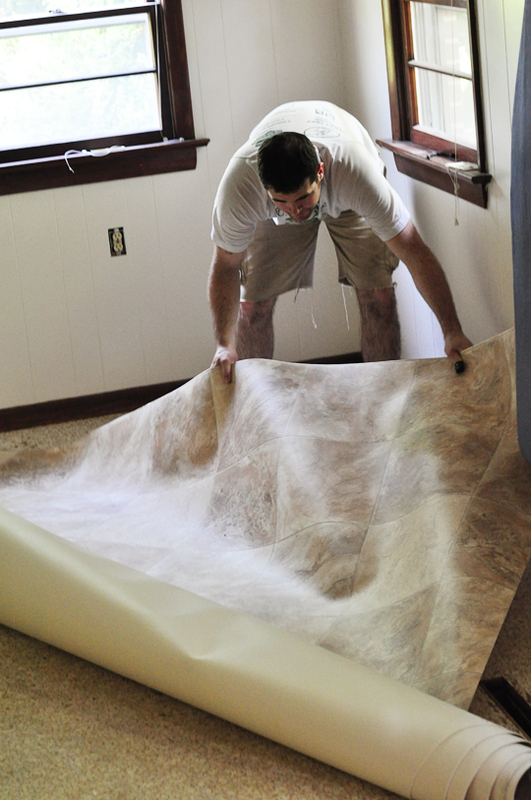 The biggest drawback was that the sheet vinyl only came in 12′ wide sections, which meant if I wanted a seamless floor in a room that’s only 7′ wide by 17′ long, I had to buy a lot of extra flooring. As a slight consolation, our floor guy promised me he’d have it cut down to 8′ wide for easier install and transport. Which is why I was surprised to show up with my friend Angie and her pickup truck with the 8′ long bed, only to learn that he hadn’t bothered. “You’re lucky my friend is prepared with bungee cords,” I said, less-than-enthused that we’d have 4′ of flooring sticking out the back of her truck. “Well I didn’t know two women were coming to pick it up!” he’d responded, as though it were relevant. I can’t explain to you the irony of an overweight, middle-aged man condescension and how it makes me feel. I just can’t. So, after some curt words that I’m positive ensured I’d never get a great deal at that establishment again, we left with our 12′ long roll of flooring. Our weak woman bodies even managed to get it out of Angie’s truck and onto my driveway with zero complications. When Justin came home, we set to work. 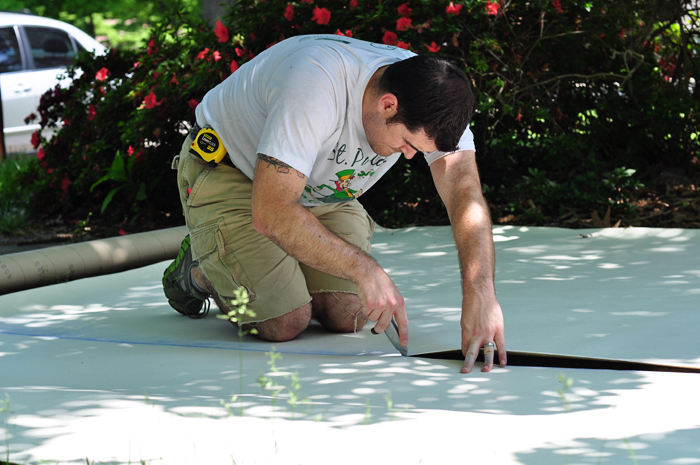 The process for installing sheet vinyl is simple. 2. Lay down and align. 4. 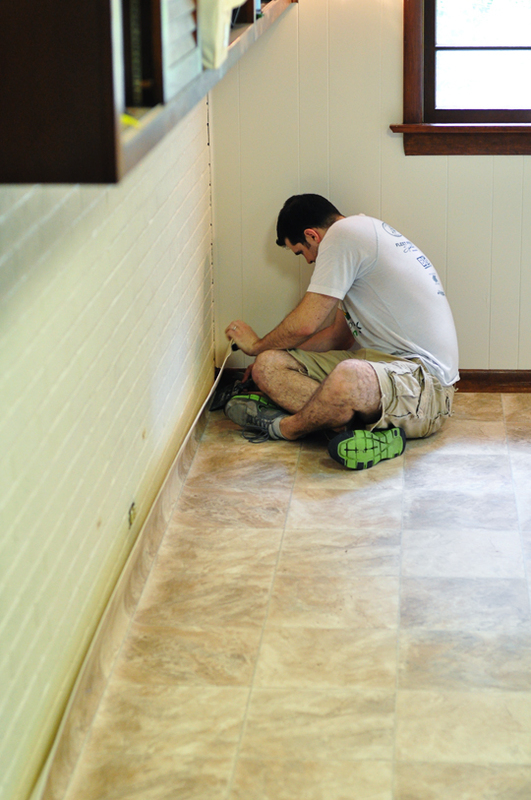 Install shoe molding and transitions. 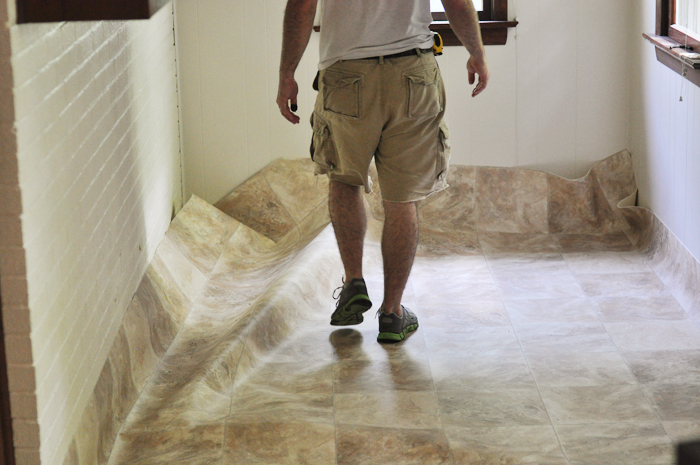 Since vinyl flooring holds its shape, it doesn’t need adhesive. The only thing holding ours down is the trim, and it hasn’t budged a bit. Style-wise, this wasn’t my favorite choice. 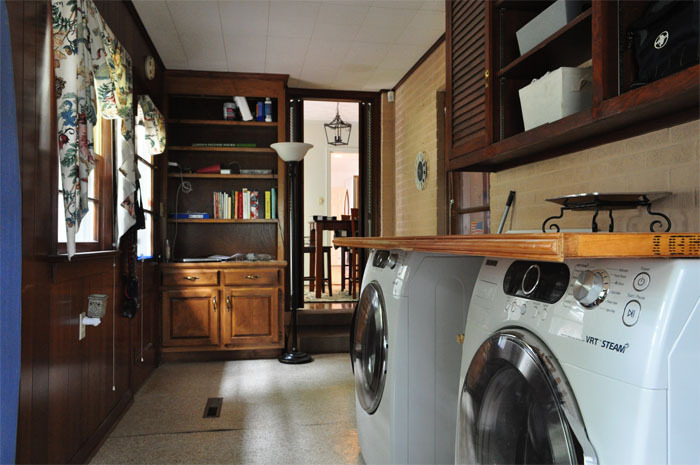 Vinyl comes in all kinds of fun colors and patterns, but at $1.30/sq. ft. and the likelihood that we’ll have to sell this house in the next couple of years, we couldn’t pass this one up. I could’ve easily done this part too, but I tend to panic when I think about something too much and realize if I screw it up, I’d have no one to blame but myself. So really, it was better for both of us that I sit back, sip a beer, and dole out sage wisdom from the comfort of my perch on the painted brick steps. It’s soft underfoot, durable, and only took a couple of hours to install. Misogynist sales guy aside, this is, by far, the easiest flooring we’ve ever installed. 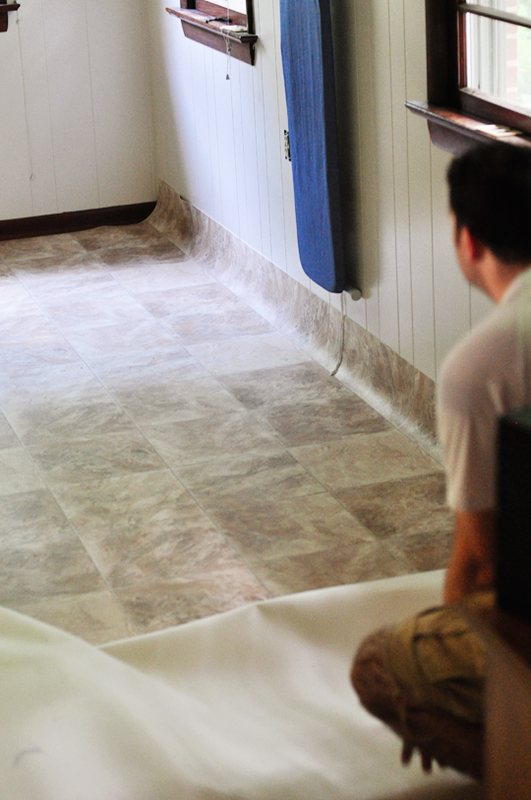 Have you ever installed sheet vinyl? Would you consider doing it? I have not installed anything and not sure I would…until I retire…that’s the only time I would have enough time on my hands to take on that kind of project. I hate men who can’t deal with women. One time my hubby and I were in Vancouver on vacation and one of his vendor’s (who splits his time between SF and Vancouver where his family lives) invited us out to dinner. The kind ignored me the whole evening, I believe it was a cultural thing, but I was pissed because he went out of his way to invite both of us to dinner (I could have found my own thing to do that night or something…)! Also recently in New York I had a female taxi driver who completely ignored me too! If I asked a question she acted like she didn’t hear, if my hubby asked the question she answered immediately! Also I think it was a cultural thing, but she was from a different region than the Vancouver guy – so we aren’t very appreciated in lots of cultures – but in U.S. it is crazy that in this day and age – because the women are the financial decision makers in the home! 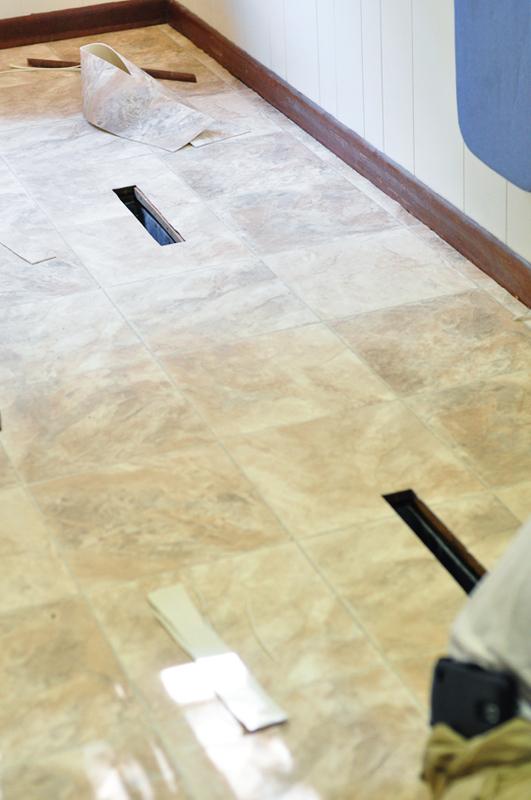 Your floor looks great…..I installed something similar in my bathroom errrrr….25 years ago! (eek that number scares me!). 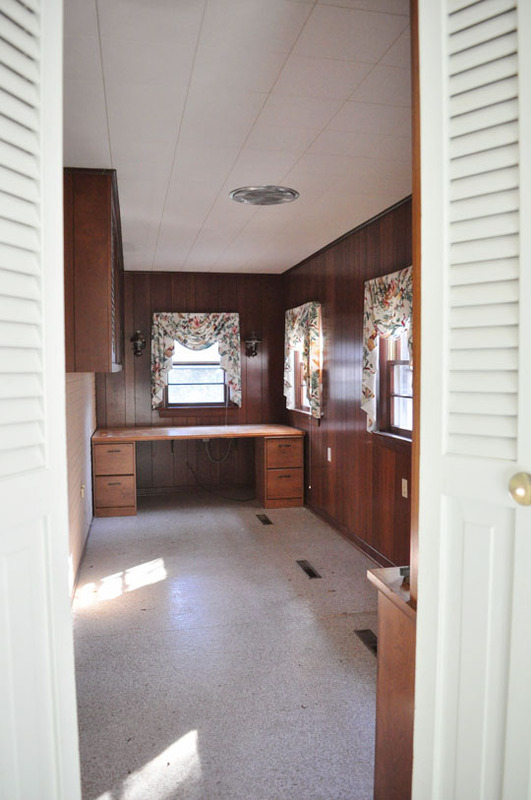 I removed the repulsive carpet (yes, you read correctly…carpet in the bathroom) and put in something like this. Removing the carpet was more difficult than putting in the new floor. About the sexist men? I am sure you can imagine how things go down for me on a daily basis….even in northern Italy. Any man over the age of 50 continuously give me instructions on how things should be done. Yeah, that’s one of the few not ideal things about living in Italy I can imagine! I still envy you though. ;) And carpet in a bathroom?? Ugh. Ick, sorry to hear about the unpleasant, sexist reno guys. I’d get pretty annoyed too. The finished product looks great to me. I’d be so terrified to cut that stuff on my own. Yeah… I can’t figure out if it’s getting worse as I get older or if I’m just more aware of it. As a project designer (almost architect), I have this issue all the time with males when I am doing DIY stuff. 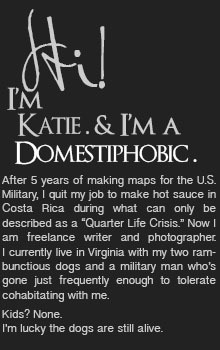 Professionally, I haven’t had an issue in almost a decade. I don’t know if construction firms are doing seminars on how not to be rude to women or not, but it is nice that every large firm I have worked with has had polite, respectful of my knowledge guys. Now if only I didn’t have an issue when I go to purchase and install things myself. I am sorry you have the same issue. Your floor and the room reno looks great!